Designs by 100 Proof Press and Stampscapes. Scene stamped for BIO (By Invitation Only) Swap on Joan Wear's website. 1) Stamp out the foreground Grass Texture 208D about three times. Proceed to mask out these impressions with a ripped paper towel or other. 2) Stamp Tree Trunk 087F on it's side. Entire object in scene is comprised of two impressions of the trunk stamped end to end connecting to make one fallen trunk. Stamp Caterpillar on trunk. Proceed to mask out tree trunk. 3) Stamp Tall Grass 253D behind fallen trunk about two times. 4) Stamp Mushrooms at various heights and angles. Mask accordingly. 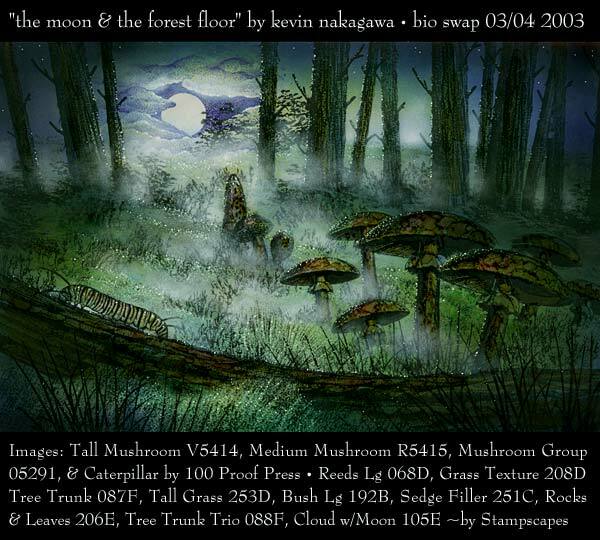 5) Complete forest floor foundation by stamping Sedge Filler 251C enough times to create space enough for background trees. 6) Stamp Tree Trunk Trio imagery. When stamping, it's better to mask off the grass where you'll be placing the tree trunks so that the bottom of the tree trunks aren't shown. This way, it will look like the trunks are going *into* the grass. 7) Stamp Reeds Lg. 068D in the foreground at different angles and mask the fallen tree trunk and stamp additional reed impressions behind the trunk. 8) Stamp Bush Lg. 192B throughout the forest floor area to create texture. 9) Stamp the leaves from Rocks & Leaves 206E at the base of the background trees to soften the transition from grass to upright tree trunks. 10) Stamp Cloud w/Moon 105E in dark blue ink. 11) Working in layers of dye based inks, flesh in the colors of the land and sky. Colors used can be, greens, yellows, blues. Build colors up from the very light to the darker colors used in the shadows. Colors on the tree trunks and mushrooms were applied using alcohol ink pens. Dye based pens can be substituted. Final layers of ink used to create the deepest shadows were black. Apply the black lightly to avoid heavy handed applications. 12) Highlights on objects were applied with a white gel pen. 13) Mist/Fog was created with white pigment ink applied with a cotton swab. For further details on ink application techniques, see various step-by-step lessons that include grassy areas and others using the pigment ink.